Nizaire Cromartie presented himself to Army and Navy as an easy target on the football recruiting trail. The academies seek guys like him -- undersized athletes carrying a chip on their shoulder to prove they can mature into a Division I player. Cromartie, a 6-foot-2, 215-pound defensive end as a senior at Greensboro (N.C.) Dudley, fit the profile. Another box he checked was a strong academic foundation that the academies require. The deal breaker, though, for Army and Navy coaches when pursuing such prospects, is to find an overachiever willing to accept the demands of a military lifestyle as an option. Cromartie checked that box, too. No hard sell was needed to spell out the long-term benefits of a free education at an elite academic institution and graduating with no college debt and a guaranteed job. Not even boot camp mere weeks after high school graduation gave him pause. Thus, the only choice left for Cromartie was choosing between the two storied football programs (Air Force also looks for athletes like Cromartie, but the Falcons don’t recruit North Carolina as much as Army and Navy). Army was on to Cromartie first, but once Navy joined the recruiting battle, he soon leaned toward the Midshipmen. The Annapolis, Md., campus on a Chesapeake Bay harbor was closer to home and the football program was coming off yet another winning season. In Cromartie’s senior high school season, Navy’s 2014 record of 8-5 was the Midshipmen’s third winning record in a row and 11th in the past 12. Army’s 2014 mark of 4-8 was its fourth straight losing season and 17th in the last 18. True to form, the Midshipmen went 11-2 in 2015 while Cromartie attended the Navy prep school and 9-5 in 2016 when he played as a freshman mostly on special teams. 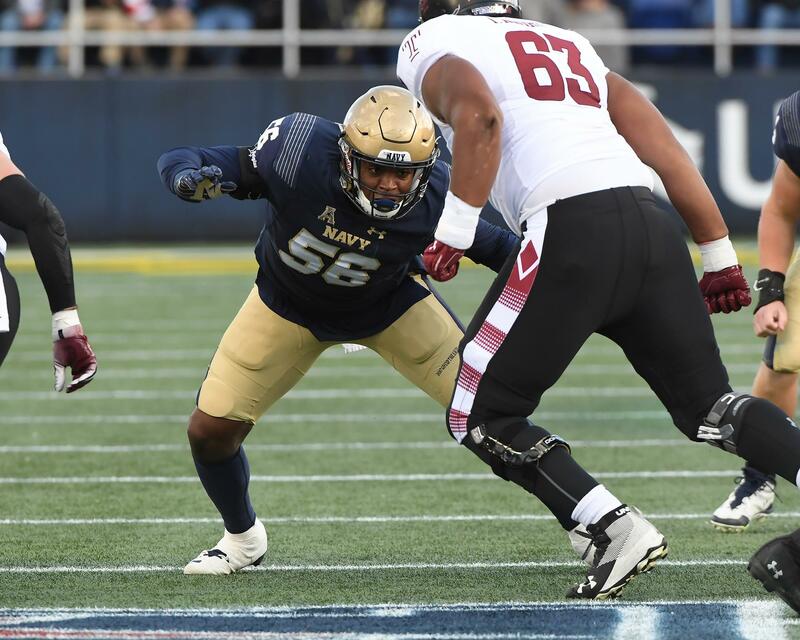 Navy did drop to 7-6 in 2017 during his sophomore year, while he saw extensive playing time as a pass-rushing defensive end, but overall it was still a winning record with a bowl trip. Cromartie’s junior year in 2018 began with him earning a starting job. The coaches shifted him to outside linebacker in spring ball and quickly adapted, having added 25 pounds to high school frame to play a 6-2, 240. But then came an unexpected fall, a thud to 3-10. It was only Navy’s second losing record in head coach Ken Niumatalolo’s 11 seasons leading the program. That has made this spring has been unlike any other for the seniors, but for the defensive players it is about more than turning the page. They’re turning the pages to learn a new playbook, too. Once veteran defensive coordinator Dale Pehrson retired at the end of last season, Niumatalolo began an overhaul. Brian Newberry was hired as defensive coordinator and Brian Norwood as co-defensive coordinator. Newberry arrived from Kennesaw State with a 4-2-5 scheme. He will also coach the safeties. Norwood, who previously coached at Navy from 1995-99, was Kansas State’co-DC until Bill Snyder retired following the season. In all, there are five new defensive assistants. Newberry brought two Kennesaw State aides with him, Kevin Downing (defensive ends) and P.J. Volker (inside linebackers). Jerrick Hall (nose guards and defensive tackles) joins the staff from Elon University. Cromartie embraces the changes, saying his role as pass-rusher remains essentially the same but with more pass coverage responsibilities. That will help disguise his role play-to-play. Cromartie was fifth on the team in total tackles with 58, but the new scheme is designed to allow him to bump his team-leading totals in sacks (3.5) and tackles for a loss (5.5). Leading a team is always noteworthy, but those are modest numbers in the big picture of a winning team. He is eager to play that role now that he’s a senior that he has developed into the player Navy’s coaches envisioned. “I’ve grown a lot from being overlooked in high school without ideal college size,” Cromartie said. “I questioned myself my freshman year if I was big enough, but as my reps increased size became irrelevant. It’s not the biggest component of being able to play football. It is knowing where the football is – not how tall they are or how much they weigh. Since Cromartie is a Dudley grad, I asked him about his high school’s unique history and one of its most decorated athletes, the late Charlie Sanders. Sanders escaped segregated North Carolina as an All-Big Ten tight end at Minnesota (1965-67), which launched his NFL career as a Pro Football Hall of Fame tight end with the Detroit Lions (1968-77). Dudley is one of only six North Carolina high schools that remained open after desegregation in 1969. Most segregated black high schools with inadequate facilities were either closed or converted to elementary or middle schools. One of the other high schools to remain open was E.E. Smith in Fayetteville, whose distinguished alums include Jimmy Raye, a Sanders rival in those days in both high school and college. Raye rode Michigan State coach Duffy Daughety's Underground Railroad. In 1966, he was the South’s first black quarterback to win a national title when Spartans and Notre Dame were named co-champions by the National Football Foundation following their 10-10 tie in the Game of the Century. Minnesota coach Murray Warmath and Daugherty were both progressive coaches willing to recruit the segregated South. Warmouth's learned of a handful of players, including Carl Eller of Winston-Salem, through personal contacts in North Carolina. What distinguished Daugherty's Underground Railroad from other progressive coaches was his network throughout the South. Michigan State gained a reputation for playing multiple black athletes and black high school coaches in the South contacted Daugherty with information, knowing he would give their players a chance. Daugherty's separation based on his reputation has been largely overlooked by history and is one of the themes the story behind "Raye of Light." The stories of Sanders, Raye and their historic high schools are necessary reminders of how recent was segregation and how far we have progressed despite hurdles remaining to to clear in race relations and creating equal opportunities.